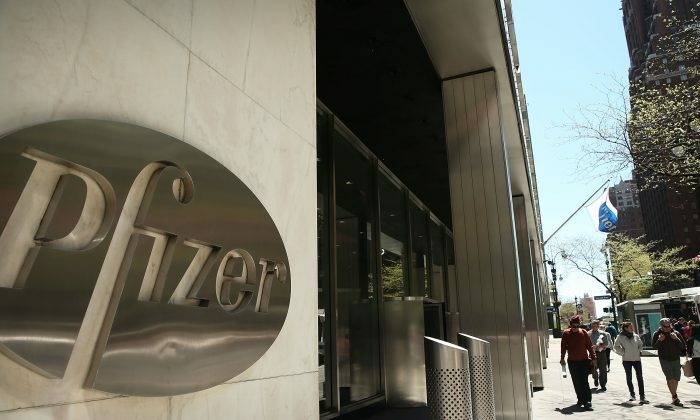 Pharmaceutical giant Pfizer Inc. announced on July 10 that it will roll back price increases on dozens of drugs that went into effect on July 1. “Following an extensive discussion with President Trump today, Pfizer’s Chairman and CEO Ian Read announced that it will defer the company’s price increases that were effective on July 1 to give the president an opportunity to work on his blueprint to strengthen the healthcare system and provide more access for patients,” the company said in a statement. Following an extensive discussion with President Trump, Ian Read announced that it will defer the company’s July 1 price increases to give the president an opportunity to work on his blueprint to strengthen the healthcare system and provide more access for patients. President Donald Trump commended the decision. “Just talked with Pfizer CEO and @SecAzar on our drug pricing blueprint. Pfizer is rolling back price hikes, so American patients don’t pay more. We applaud Pfizer for this decision and hope other companies do the same. Great news for the American people!” he said in a tweet on July 10. Trump’s Health and Human Services secretary, Alex Azar, also chimed in. “Thank you @POTUS for your leadership and determination to put American Patients First. Pfizer’s announcement to roll back prescription drug increases will long be remembered. This is a step in the right direction and a major win for American patients,” he said in a tweet less than an hour after Trump’s. Thank you @POTUS for your leadership and determination to put American Patients First. Pfizer’s announcement to roll back prescription drug increases will long be remembered. This is a step in the right direction and a major win for American patients. On July 9, Trump had criticized drug companies, and Pfizer by name, for recently increasing the prices of more than 100 drugs. This was the second hike by Pfizer—which already raised prices on 41 drugs—after several drugmakers increased list prices of dozens of labels in January, according to Wells Fargo analyst David Maris. Pfizer now agreed to postpone the second hike until the end of the year or until Trump’s plan to lower drug prices goes into effect—whichever is sooner. Pfizer also said the price cuts on five drugs that also went into effect on July 1 will remain in place.